This Bible is geared for people seeking personal growth, which includes emotional health and wholeness. It can be difficult to translate God’s word into an effective plan to stay spiritually healthy, especially as we grow and enter new phases in our lives. The Bible always holds relevant lessons, but sometimes it takes an experienced guide to help you grow, wherever you may be in your life. 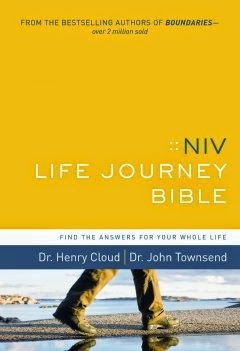 Doctors Henry Cloud and John Townsend—bestselling authors of How People Grow and the Boundaries series—bring you the NIV Life Journey Bible, the full text of the Bible’s most accessible translation paired with their own acclaimed teachings. This Bible provides invaluable support for personal growth and wholeness. I have been in search for a new Bible so when I saw this one up for review I snatched it up. When I saw that the contributors were Dr. Henry Cloud and Dr. John Townsend I was super excited to get it! I love how sturdy this Bible is! That's one of the reasons I was on the search for a new one, my old one has a paper cover and just isn't holding up over the years. The NIV Life Journey Bible is so sturdy, I'm sure it would hold up perfectly for years and years! This Bible is also easy to read and holds such great nuggets of advice for your daily life! I would recommend this Bible to everyone, men and women both.